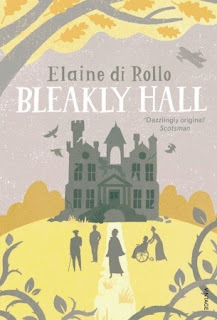 After the Great War, Nurse Montgomery (known as Monty) is reunited with wartime friend Ada at Bleakly Hall, a strange hydropathic hospital (or is it a hotel? It's hard to tell) where older people come to partake of the curative waters in the form of various types of baths ("douches") and other water therapy. The hall is crumbling, the pipes groan and sputter noisily, and business is failing. Co-owner Grier Blackwood hopes to improve the popularity through advertising geared towards younger folk and by changing some of the long-standing rules and traditions of Bleakly. Monty has come for quite different reasons though; she is tracking down Captain Foxley, who she considers responsible for a close friend's death during the war. Monty is brisk and business-like, just the sensible kind of person to get to the bottom of trouble and get everything sorted out. When it comes to Captain Foxley, Monty definitely has blinders on and is so focused on revenge she has a hard time seeing the consequences of her actions. Her presence at Bleakly solves problems and stirs up trouble in equal measure. It's not entirely her fault however, thanks to an array of darkly comical and troubled characters whose eccentricities in some cases border on mental illness. Their delightful foibles lent the novel a bit of a slapstick air, but in the best way possible. I pictured most of it as a hilarious and quirky dark comedy film. In one especially memorable scene Bleakly staff shuffled guests outside and down the hill to the pump house to indulge in fortifying glasses of Lady Beaton water, one of several varieties available from their special pumps. I could see the ragtag group traveling in bath chairs or walking arm in arm for support, probably wearing pajamas and robes, walking past the crumbling moss-covered houses of the village. Bleakly Hall's structure is a character itself with it's groaning pipes and mysterious stenches, an unsettling and ominous backdrop looming over its staff and guests. Of course, underlying the frequently lighthearted tone are fairly serious themes and issues. Many of the characters, including the Blackwood brothers, were actively involved in the Great War and were haunted by memories of their time at the front and the people they lost there. Foxley was also a serial womanizer, leaving a trail of heartbreak and ruined lives in his wake, and the reason for his apparently flip attitude about this is fairly horrific. But tempered with the author's colorful writing style and gift for comedy, it became fun and engaging. Much like di Rollo's A Proper Education for Girls, this novel had a pronounced feminist slant. It wasn't preachy or too obvious, just great strong female characters who know what they want and aren't afraid to go after it. They stand up for each other as well as for themselves, and I found their supportive friendships touching as well as empowering. I loved A Proper Education for Girls and was very excited when I heard that di Rollo had another book. Alas, this one is unavailable in the US. I ordered it from Amazon UK, along with a couple others that I can't get here. So if you're in the US and want to read it, you may have tough time unless you're willing to pay for international shipping. (Of course, if you know me personally I'd be happy to let you read my copy.) For me, it was well worth ordering from afar. And isn't the cover art fantastic? I love the shadowy gothic style, which is perfectly suited to the story. This author hasn't gotten a lot of attention (at least not here in the US) despite the great reviews her books earn, and I can't imagine why. I love her unique tone and style and I hope she keeps writing for years to come. Oh lovely, thank you so much, I didn't know about this! I loved A Proper Education For Girls so will be ordering this one straaight away. Thank you for writing such fantastic books!